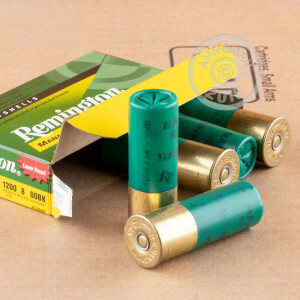 Remington Managed Recoil ammunition is a great choice for shooters who want the versatility and power of a 12 gauge without the punishing kick. These 2-3/4" shells fire 8 pellets of 00 buckshot at a muzzle velocity of 1,200 feet per second, trading a small loss in speed for a huge reduction in recoil! When multiple shots are a possibility, this ammunition excels. Reduced recoil in a self-defense situation helps you make faster follow-up shots, resulting in a greater probability of stopping an assailant. At the range, this ammo contributes significantly to reduced shoulder fatigue, allow you to get more practice in without resorting to low-power birdshot loads that don't provide realistic training. This ammunition comes in boxes of 5. 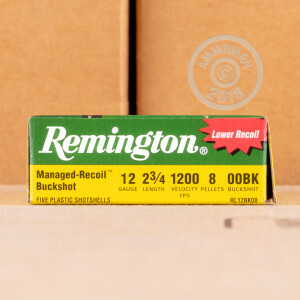 It is loaded at Remington's main ammo production facility in Lonoke, Arkansas.